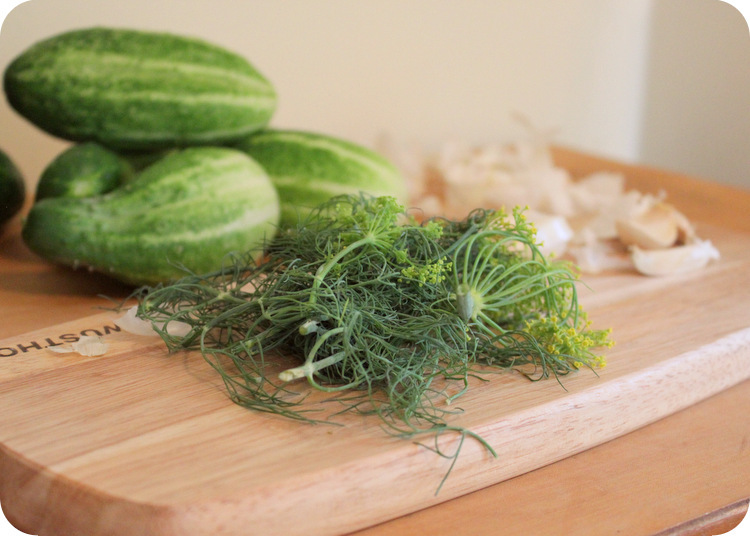 They are crunchy, salty and full of great dill and garlic flavor with that awesome lacto-fermented tang that is highly addictive and unique. 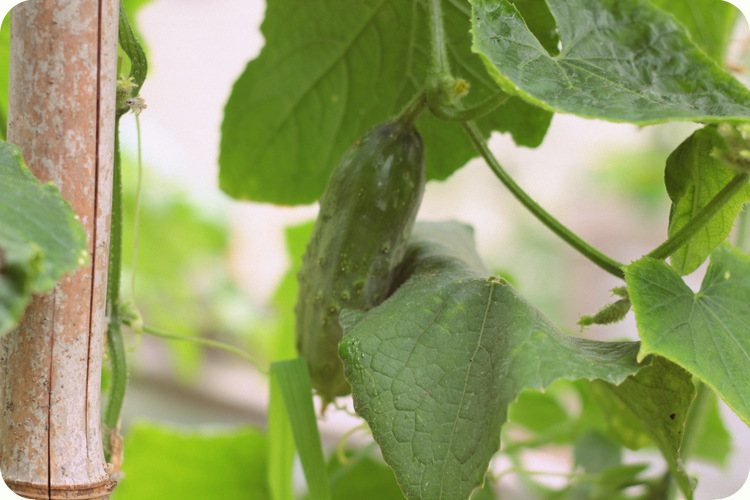 I went a little nuts on planting cucumbers this year with these pickles in mind. 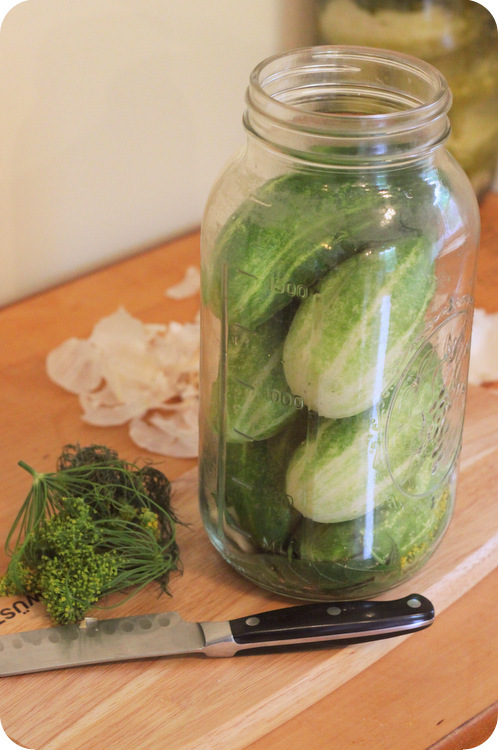 Luckily you can get great pickling cucumbers at most farmers markets and farm stands in the U.S. this time of year so even if you don’t have cucs ripening by the minute outside your door you can still make a batch of these. I’ve written many times about my love of lacto-fermented food, including with my recipe for saurkraut, kimchi, and pickled vegetables. They have a unique tang and je ne sais quoi that can’t be found in any other food. Plus, the naturally occurring “good bacteria” (probiotics) has improved my immune system dramatically. 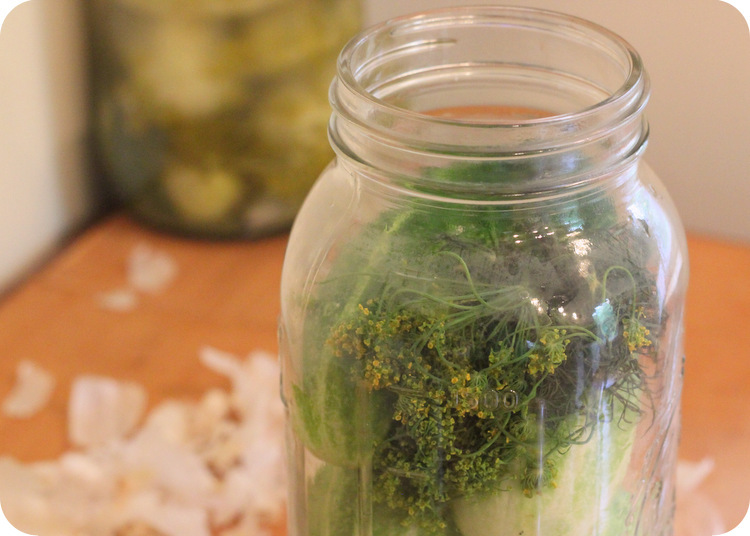 Like most lacto-fermented food, this recipe is really just a guideline. The only important ratio is the 5 tablespoons of sea salt to the 2 quarts of water; the garlic and dill are more of a personal preference. 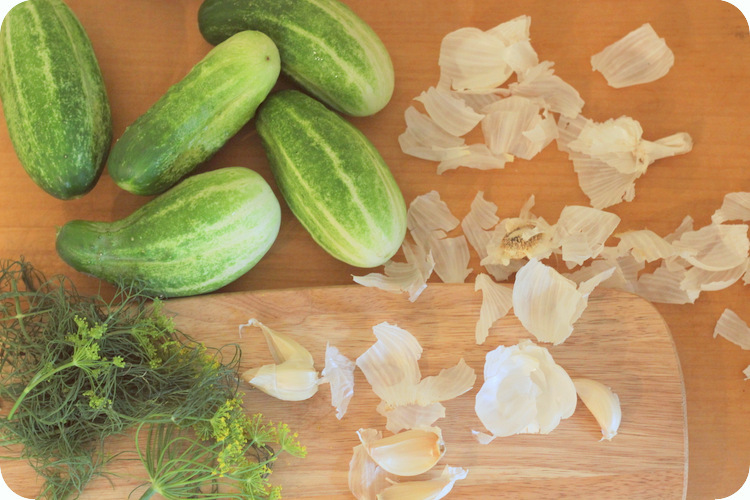 Keeping the cucumbers whole helps keep them crunchy! 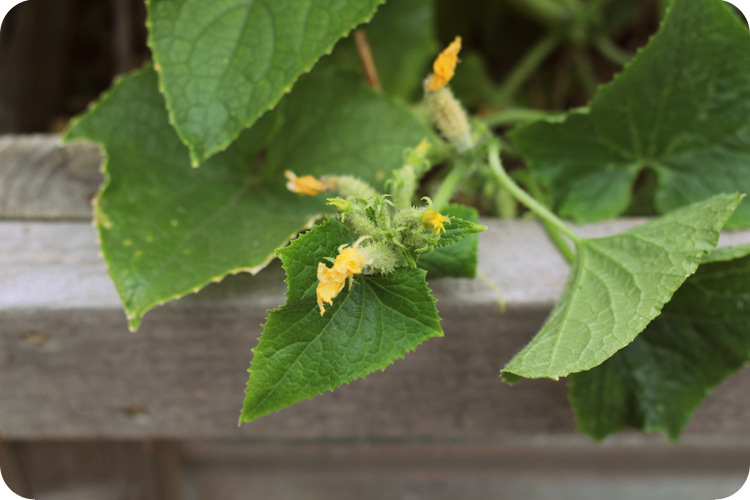 Another thing that helps keep them crunchy is the addition of grape leaves. 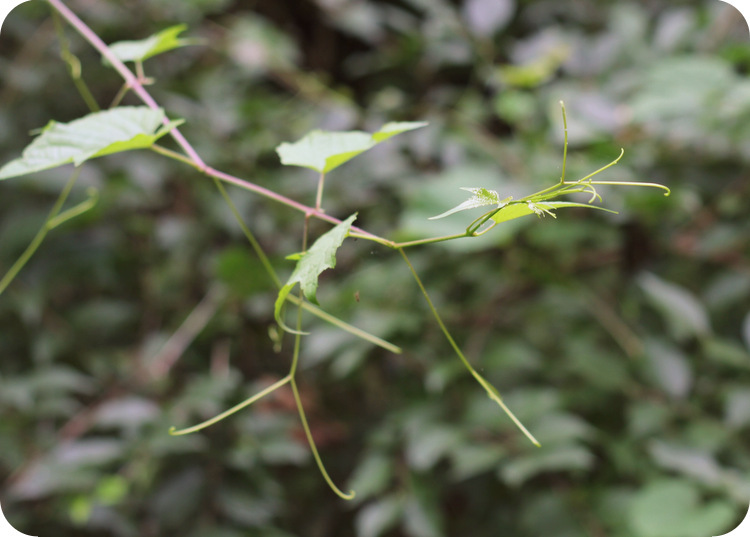 There is a tannin in the leaves that does this, oak leaves and horseradish leaves can also be used but grapevines are a bit easier to come by. I have a disgusting amount of wild grapevines in my backyard so I didn’t have to look hard to harvest for this batch of pickles. 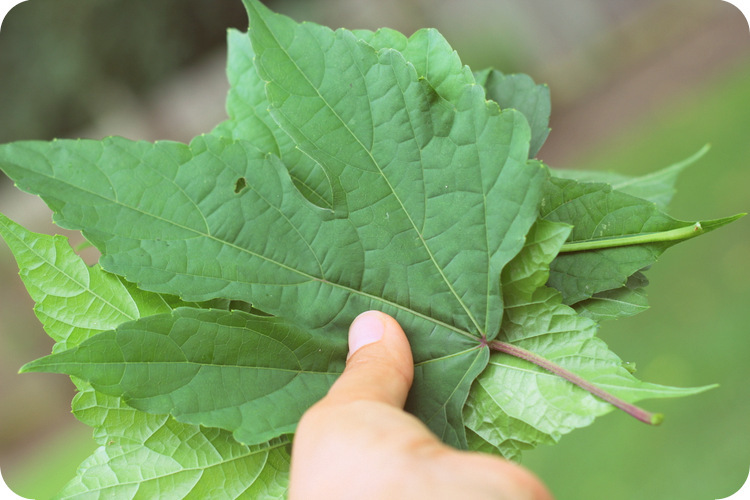 The grape leaves also provide a bit of a protective layer for the top of the brine, which can get a little filmy sometimes, more on that in the recipe. 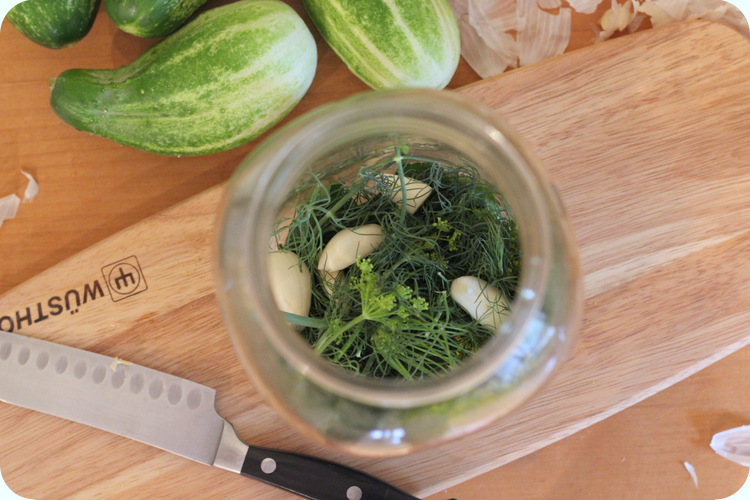 Start by laying down half of the leaves in the bottom of your jar, followed by half the dill and garlic. 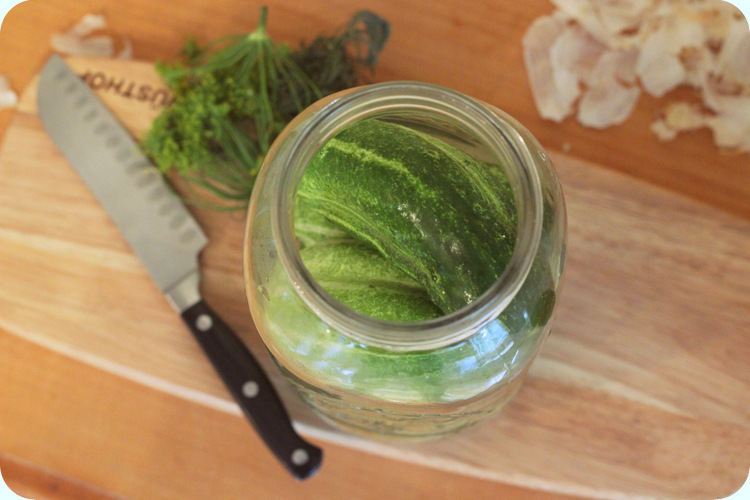 Fill the jar with the cucumbers, packing as tightly as possible. Stuff the rest of the dill and garlic down into the holes. 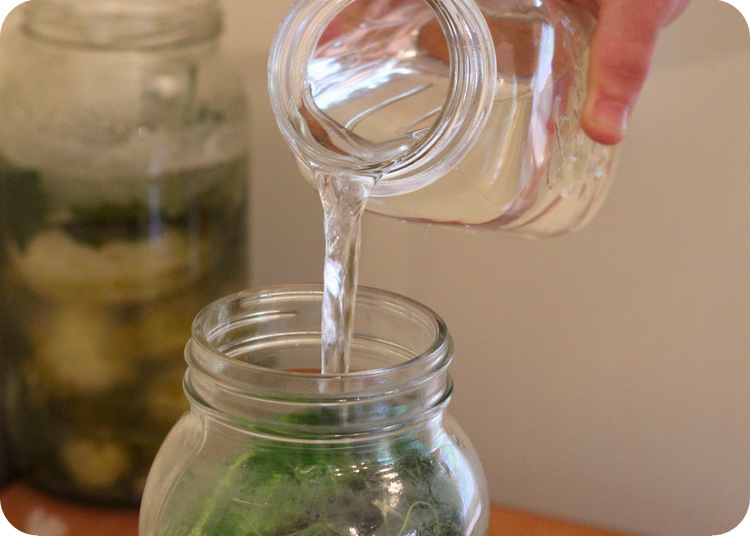 Fill the jar with the salt and water brine solution (details in the recipe), leaving at least an inch of headroom. Lots more details in the following “recipe”. 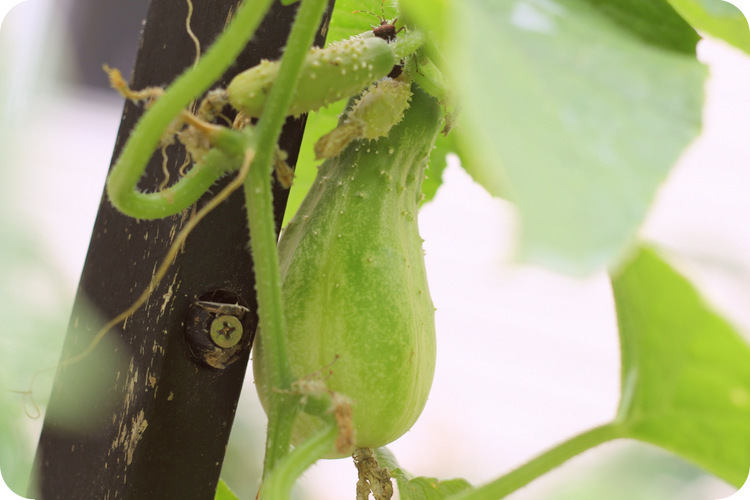 *The amount of brine (water and salt solution) you need depends on the size and amount of cucumbers you use. This recipe will probably leave you with leftover brine that can be saved for your next batch. After 5-8 days taste for flavor, the pickles should still be crunchy and should look and feel “pickled” all the way through (not just on the surface. At first they will be more salty than tangy. At this point the top grape leaves can be tossed, the top bit of brine poured off if filmy, and the jar moved to the fridge. Pickles can be kept in the fridge for several months, although the crunch will diminish with time. I’m pretty simple with my pickle-eating; they are usually eaten straight from the jar while making lunch or occasionally cut thin for a sandwich. Either way, these pickles f-ing rock! You should probably go make a batch..or five…asap.